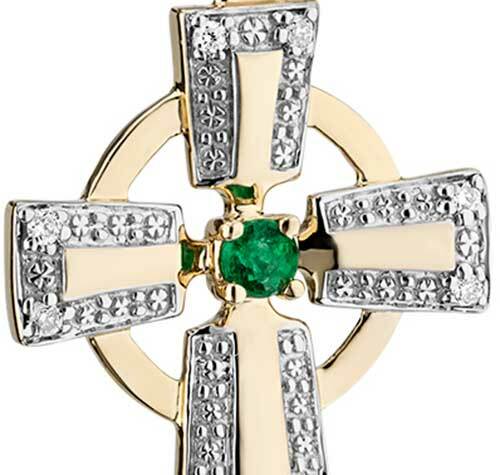 Celtic cross necklace is a 14K gold design that features a center emerald along with diamonds that are set in the corners of the white accented border. This gold Celtic cross necklace, with engraved 14K white gold accenting, features a 2.5mm emerald in the center and is enhanced with eight diamonds, one in each corner for a 0.055 total diamond weight. The emerald Celtic cross pendant measures 5/8” wide x 1 1/8" tall, including the jump ring and the chain bail, and it includes an 18” long, 14K yellow gold chain. This piece of Irish jewelry is gift boxed with a Celtic cross history card, complements of The Irish Gift House. 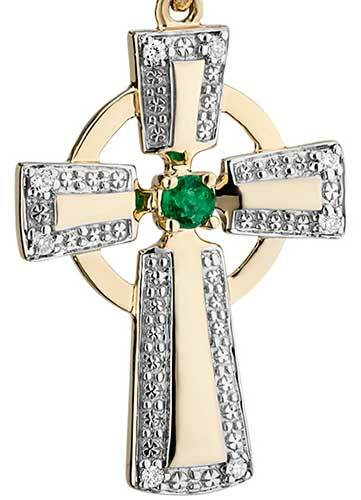 Celtic cross necklace is cast in 18K white gold that features a center emerald and is studded with diamonds. 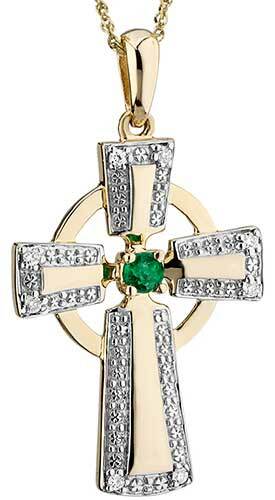 Gold Celtic cross features a necklace that is set with emeralds and is enhanced with white gold accenting. This gold Celtic cross pendant features an emerald and diamond enhanced Claddagh symbol and is also augmented with Celtic knots.